In this weeks parsha the Jews are busy donating towards the building of the Tabernacle. 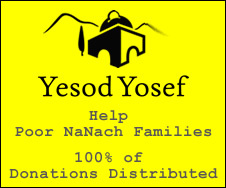 Rashi points out that all the donations were completely according to each persons generosity, except for the half shekel which was an obligation upon everyone equally. Many of the commentaries are explaining how the half shekel signifies the equality of each Jew and their bond with one another. מחצית השקל - half shekel - has the gimatria (numerical value) of 983, which is twice נ נח נחמ נחמן מאומן - (because they were giving half of that) 491, and an extra, which correlates to the Kalbon - which is an extra amount levied upon a person who comes to pay the half shekel for his friend.